THE OUTSIDER is a series of photographs of people in China creating portraits of each other. “As a foreigner in China, I struggled to find a way to create portraits there with any degree of authenticity. I know very little about the experiences of the Chinese people and don’t speak their language. I felt reluctant to impose my Western view on another culture, like so many of the 19th and early 20th century photographers did on their first visits East. I decided to observe and photograph people taking photographs of each other. That would be my way in. After having so much control in the studio where I usually work with an 8 x 10 view camera, working on the street with a hand held camera felt liberating. No one paid any attention to me so I wandered through massive crowds of people and waited for an intimate moment. I never spoke to anyone. I felt invisible, like an unseen ghost. I call the project, THE OUTSIDER because I was on the outside both as a stranger in unfamiliar physical and emotional territory, and also as a photographer. It’s not so much the inverse of what I’ve done in the past but that I am giving up my role as part of the photographer/subject relationship. 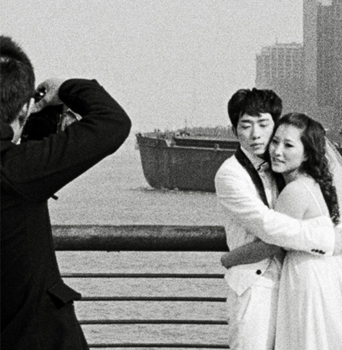 The photographs were taken with a Leica MP using available light, and Kodak Tri-X film that Heyert brought with her to China as film is no longer sold there. The final prints are 16 x 8 inches (40.64 x 20.32 cm) gelatin silver on Ilford paper in an edition of 10 each.